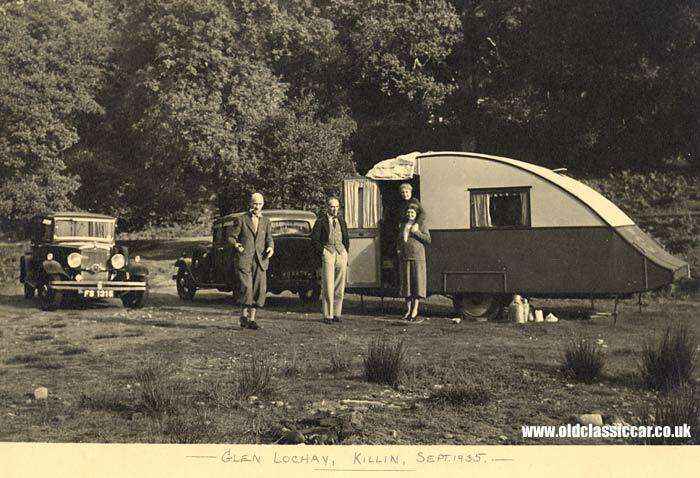 Pre-war touring caravans of the early 1930s. Homepage. 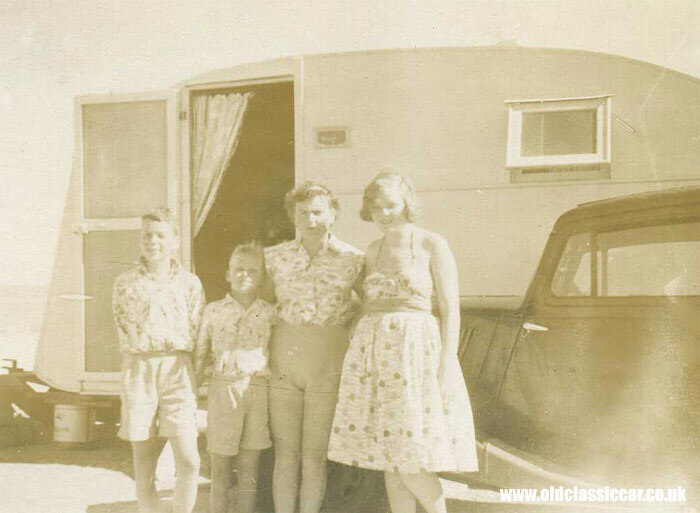 This page: Snapshots of pre-war caravan holidays, with adults and children stood alongside their touring 'vans. Old caravans feature in various locations across the site, with the majority of the information grouped in the historic caravan section. 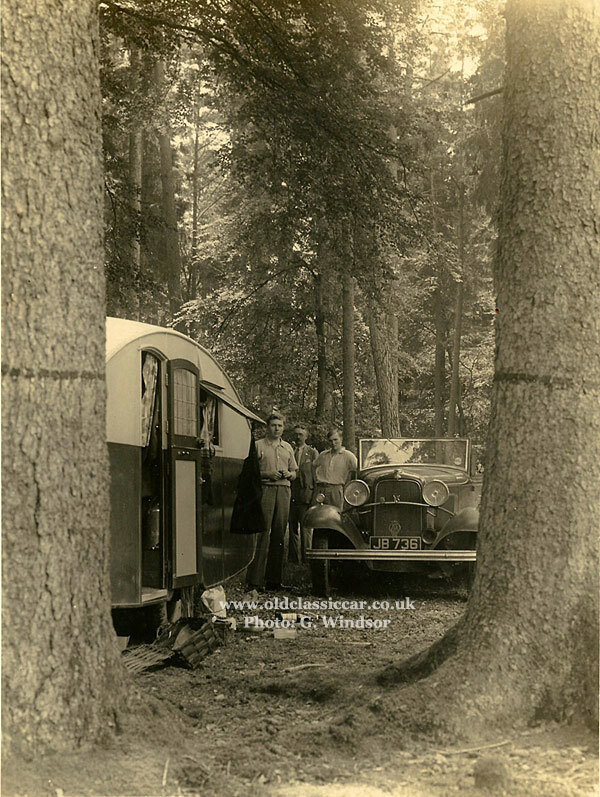 The first photo to feature in this section was sent in by Des, he scanned a number of pre-war motor-related scenes and amongst them was this one, featuring a caravan of the early 1930s. Also visible to the left is a vintage motor-car, possibly an Armstrong Siddeley according to Des. 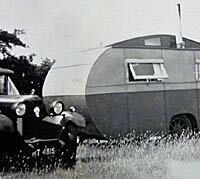 It would have needed to be a hefty machine in order to successfully tow the caravan - unlike modern day 'vans that are generally made from the lightest possible materials, in the early days of the touring caravan, quality materials were still to be found, at least in the more upmarket models. Cupboards would be crafted from the finest oak, and the chassis formed from steel. No contiboard or aluminium in sight, other than perhaps the kettle and other kitchen equipment. No mains electricity for the pre-war caravanner either, gas lights tending to be the most common source of light back then. 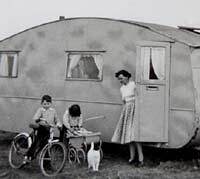 So although in some ways primitive, going on a caravanning holiday offered many more creature comforts than you'd enjoy - or endure - sleeping in a tent (even if you had a Jagrose Car Tent!). Maybe a caravan enthusiast recognises the make and model of caravan shown here? The roof covering looks especially interesting, reminding me of the fabric & dope covered fuselages of WW1 fighter aircraft. Some aircraft manufacturers did diversify into caravan manufacture, so perhaps this is an example of just such a van. Thanks to Des for sending the photo over, and allowing it to be shown here. 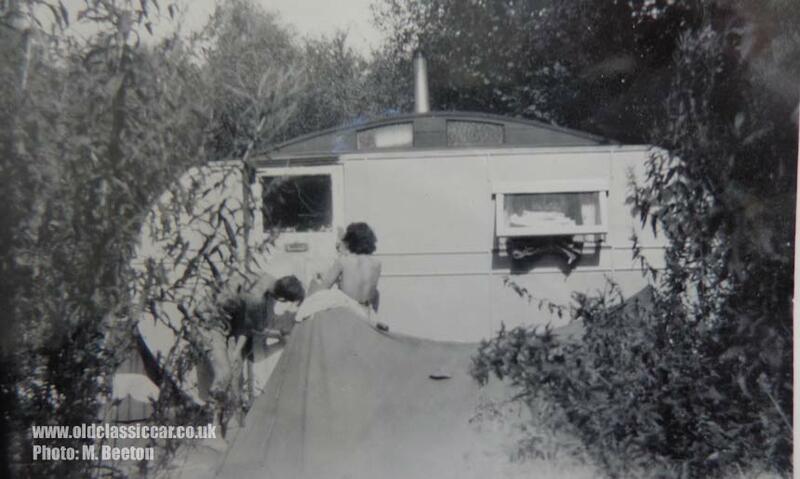 David Bell sent the next photo over, and hopes that someone will be able to identify the sleek caravan shown below. The photo was taken in 1935 at Glen Lochay. Two Scottish-registered pre-war cars are also in shot, a Morris (regn FS 1315) and an unidentified car (regn KS 5523). 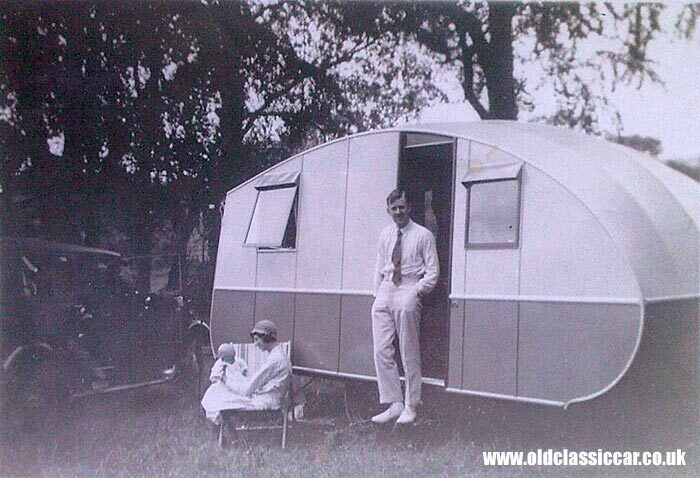 This vintage caravan had been designed with streamlining very much in mind, and appears to feature either a logo or lettering on it's curved rear panel. Can anyone identify this cracking pre-war 'van? Thanks to David for giving permission to show the photo here. 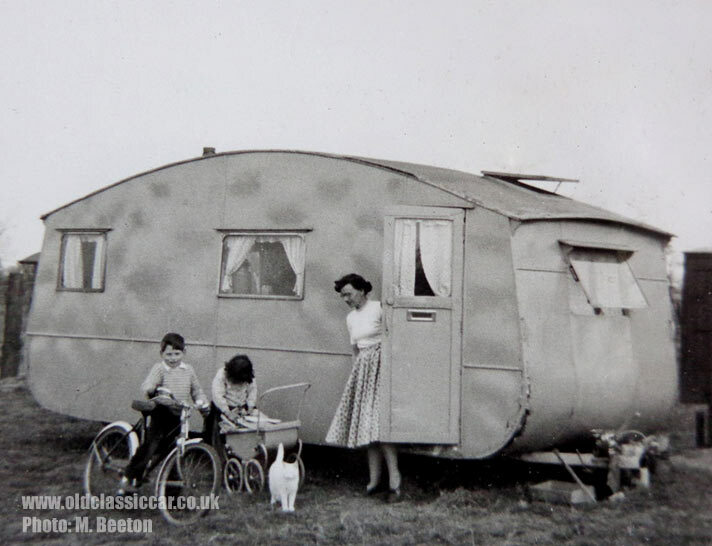 Update A member of the forum has identified the caravan as a Thomson, and adds: "Made in Scotland by Daniel Thomson, a Scottish joiner who had been making caravans since about 1908. The shallow tail of the caravan was used as an outside locker." 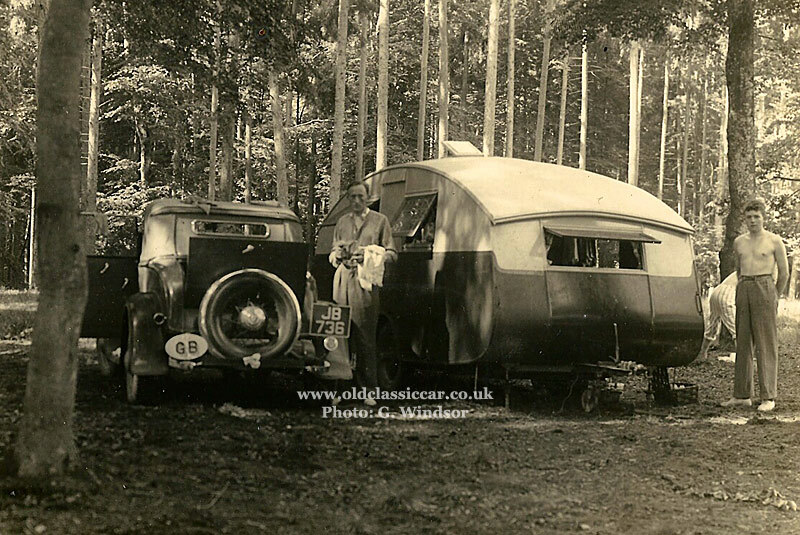 The following two photos show a pre-war tourer on a family's holiday, with a Morris 8 also in evidence. Judging by the clutter underneath the van, it looks like it is semi-permanently located in this position. 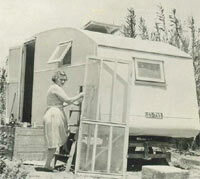 The first photo shows a lady leaning a pair of ladders against the side of this early caravan. The style of registration plate is interesting, does anyone recognise its origins? 4. 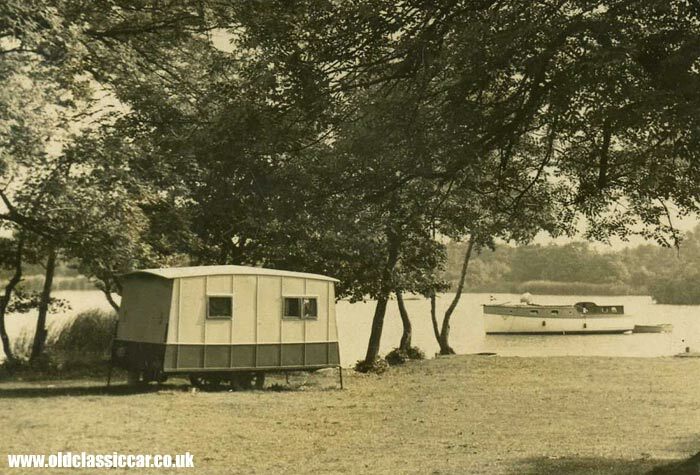 Vintage caravan alongside a lake. This lakeside view must date to the early 1920s, I'm hoping that someone will recognise the make of caravan, and possibly even the location of this scene. Heavy artillery-type wheels are fitted to this 'van, as is a small plaque on the rear - possibly for "GB". 5. 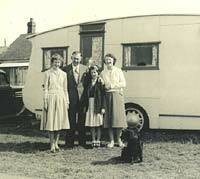 A family stood with a '30s caravan. 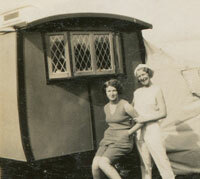 I'm sure someone out there will recognise the make of 1930s caravan shown in this next photo. 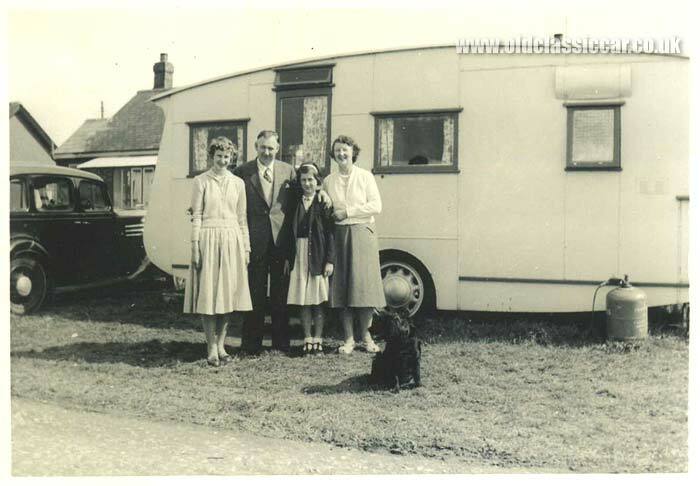 A family of four, plus hound, are stood with their 'van, perhaps on holiday. The gas bottle has already been connected up. Did the small 8hp/10hp car to the left really tow this hefty-looking caravan, or (more likely) was it towed there behind something a little more substantial? 6. 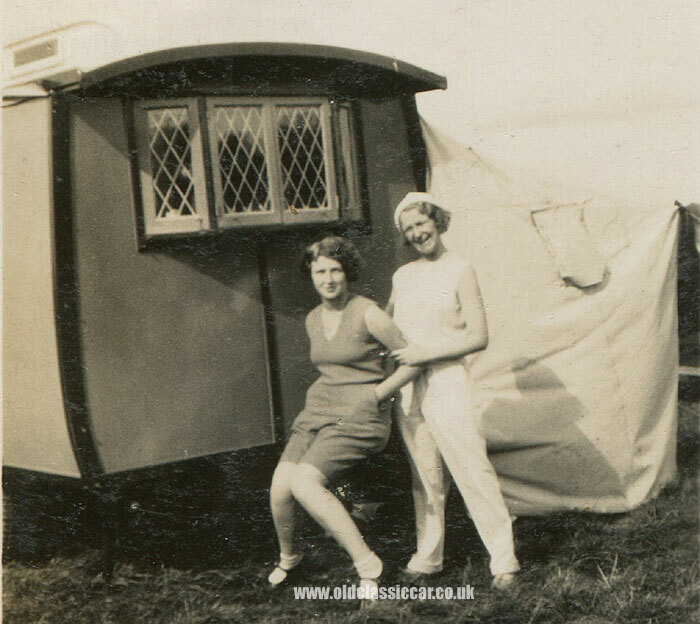 1920s Eccles caravan visits Pagham. Motor caravanning took off in the 1920s, the caravan owners keen to taste the country air and escape from suburbia and inner-city smog for a few prized weeks, or maybe just days, per year. The advent of relatively affordable motoring made all this possible. 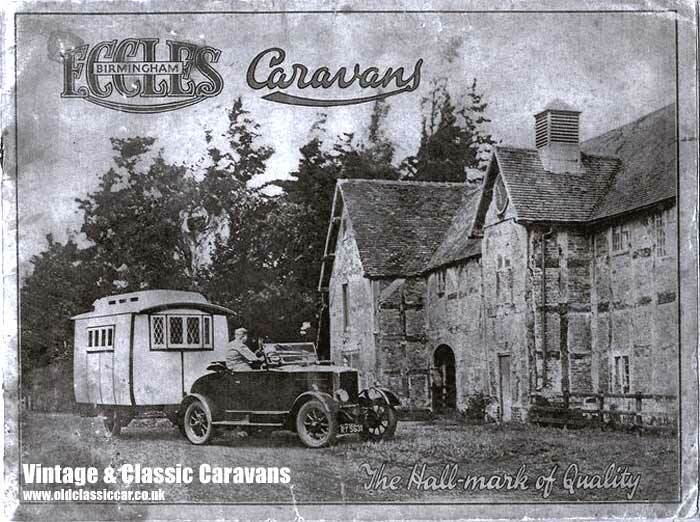 This next shot is of one of the most popular brands of caravan, Eccles, dating as it does to the early years of the 1920s. Sadly the car used to haul this ancient 'van isn't in shot, it would have had to feature an engine of reasonable grunt to haul around this mobile living accommodation. Note the leaded windows set into proper wooden frames - no cheap plastic double glazing or MDF here, just oak fittings, enamel mugs, and a proper stove for those chilly nights. The two ladies in shot certainly seem pleased with their family's purchase - the snap was taken in Pagham, September 1932. A scan of an Eccles catalogue from the 1920s has featured on the site for some time, and warrants another mention here. In this scene, a two-seat Morris has been entrusted with towing the caravan. 7. Two unidentified early caravans *updated*. Martin contacted me in March 2013, with the following two photographs. 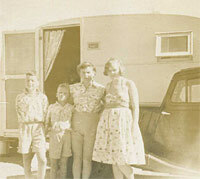 They show caravans that belonged to his parents, in the 1940s. He was keen to find out whether either or both could be identified. His parents lived in caravans for a while, and travelled around the country with one on a regular basis, as his father worked for Kelly's Directories. 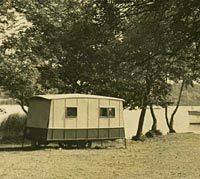 The first is a side view shot of a camping scene, the distinctive shape of the caravan may well aid its identification. Update. 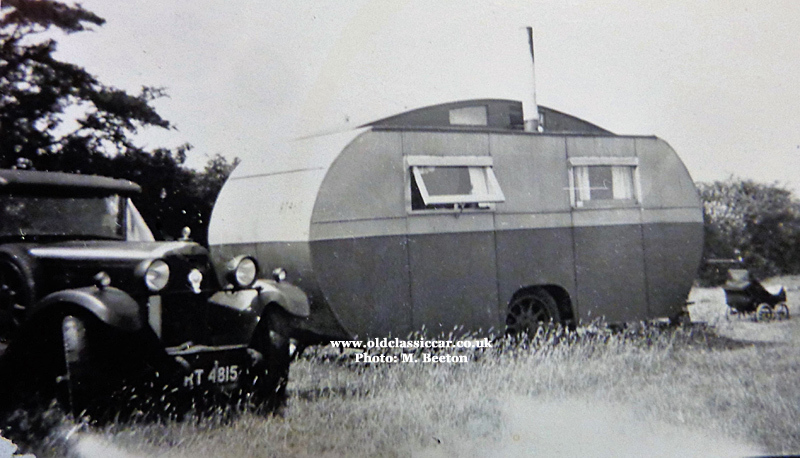 Early in 2017, Martin dropped me a line again with not only an update regarding the origins of both caravans he supplied pictures of, but also another photograph of the older of the two. He adds:"I am happy to say that I have finally managed to find out some more information regarding them, having come into the possession of some old letters from my uncle after he died. 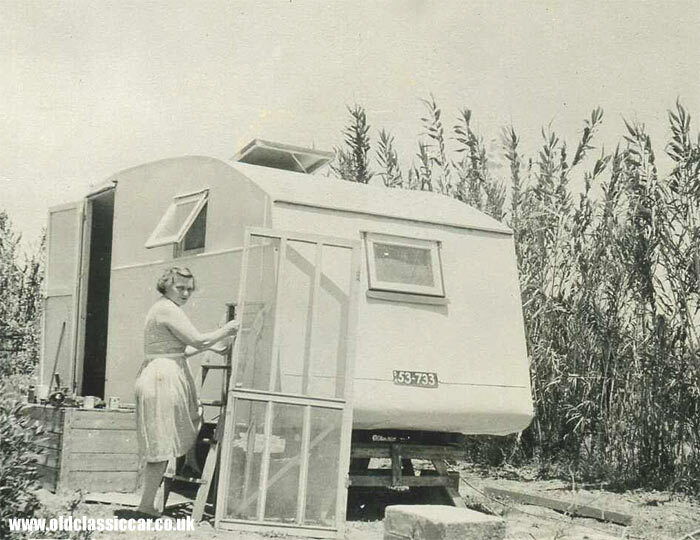 The upper (older) caravan was a home-made affair, made in Great Yarmouth by a small local firm. It was originally a two-tone orange and green colour. 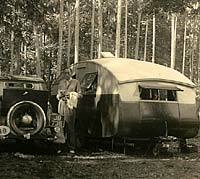 I have a picture taken in 1948 showing the 1928 Talbot with the caravan (below). The Talbot had a 1.66 litre engine with overhead valves, pretty advanced for the time! It produced 45 brake horsepower and could get up to 60 mph. How could cars like this tow heavy caravans around, especially on the steep hills? Incredible to think about these days. Dad used to travel from town to town so thought this arrangement of towing a caravan around from city to city ideal for his job for a few years, until I reached school age. I miss those days!" "By the way, you might have noticed that the upper of the two pictures of the older caravan had different paint schemes - the top picture shows the entire caravan had just been painted (brown). One more thing - note the chimneys of those caravans. Not only a travelling home but fully functioning fireplace too. Dad used to roast a turkey on it at Christmas, on a clockwork brass spit." 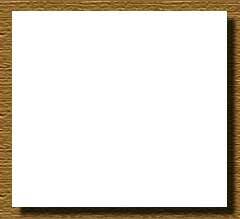 The second is of more conventional appearance. Martin's email from 2017 confirms this caravan's identity: "It's a Thompson Kelvin Star, made just after the war. Just after getting the caravan, my parents traded in the old Talbot for a 1936 Hillman Hawk." 8. Caravanning in Germany, 1935. George, a regular correspondent with the site for many years, emailed over these superb old photographs. They belong to a contact of his, who wishes to remain anonymous. His Great Grandfather, Grandfather and Great Uncle are all shown. The pictures were taken on a European tour of Europe that took place in 1935, the location here being Southern Germany. A 1932 Ford Model B V8 is the tow-car, a car that would have had ample grunt to tow the stunning pre-war caravan. Its registration is JB 736. The first is a head-on shot of the Ford, parked close to the caravan. 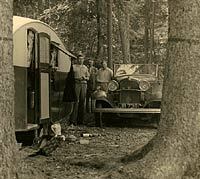 Photograph two shows the rear of the Ford (note the GB plate), and gives a better idea of the caravan's 1930s' styling. Return to Old Motoring Photos Page No. 9. 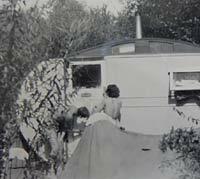 There are several photographs dotted about the site that also have caravans appearing in them. Two superb photos that both feature a 1920's Eccles, and a rather fine Daimler, may be seen here.